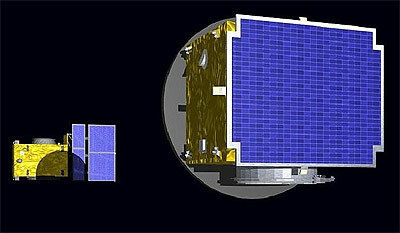 PROBA-3 (Project for On-Board Autonomy 3) is ESA’s first close formation flying mission. A pair of satellite will fly together on a coordinated basis, evaluating techniques for flying in tandem. As is standard for the Proba series, the mission has scientific as well as technology-demonstrating goals. The mission will demonstrate formation flying in the context of a large-scale science experiment. The paired satellites will together form a 150 m long solar coronagraph to study the Sun’s faint corona closer to the solar rim than has ever before been achieved. Beside its scientific interest, the experiment will be a perfect instrument to measure the achievement of the precise positioning of the two spacecraft. 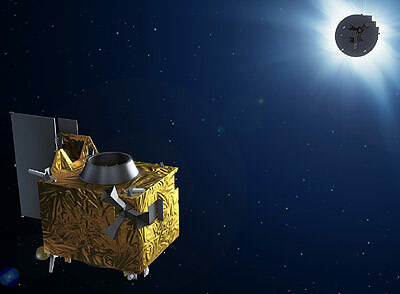 Both the larger Coronagraph and the smaller Occulter satellites are derived from ESA’s standard Proba platform. The 340 kg coronagraph satellite has a volume of 1100 × 1800 × 1700 mm3. It hosts the coronagraph instrument which will point directly at the Occulter satellite to observe the corona of the Sun. It takes power from a deployable solar array. Its front panel has an opening for the coronagraph instrument and for optical metrology sensors. The guidance, navigation and control (GNC) system consists of four reaction wheels, 2x3-axis gyroscopes, one three-headed star tracker, six Sun sensors and two GPS receivers. The majority of the formation flying system is housed within the coronagraph satellite which performs most of the manoeuvres. The 200 kg Occulter satellite has a volume of 900 × 1400 × 900 mm3. Its main task is simply to block the Sun for the coronagraph instrument, with a 1400 mm diameter occulting disk on its face pointing away from the Sun. The opposite side accommodates the satellite’s solar array. Its GNC system consists of four reaction wheels, three three-axis gyroscopes, one triple-headed star tracker, six Sun sensors and two GPS receivers. The two spacecraft will operate in an highly eccentric Earth orbit with 19.7 hours orbital period and an apogee of 60524 km and a perigee of 800 km. Launch is planned for 2019.